In late 2017, the Public Affairs Research Council of Alabama (PARCA) surveyed Alabama voters to determine their thoughts about the general direction of the state and the issues that most concern them. PARCA partnered with Samford University to survey policy professionals from across the state, including academics, journalists, business and nonprofit leaders, and lobbyists. Their responses provided a list of 17 critical issues facing Alabama. PARCA partnered with USA Polling at the University of South Alabama to ask registered voters about these 17 issues. The voters’ responses generated the Top Ten list of voter priorities. Details about the survey and its methodology can be found in the full Alabama Priorities report. Voters broadly agree on the critical issues facing the state. Voters are not polarized along traditional political, ideological, racial or generational lines. There is a significant gap between the priorities of experts and the priorities of voters. Policymakers have an opportunity to inform and educate voters on critical and systemic challenges facing the state. Policymakers have an opportunity to respond to immediate, often highly personal issues that concern voters. Elected officials and candidates have an opportunity to show leadership and to build broad coalitions to address Alabama’s most pressing challenges. In the following months, PARCA will produce summary briefs on each of the top ten priorities chosen by Alabama voters, starting with #10. Each brief will answer four critical questions: what is the issue, why it matters, how Alabama compares, and what options are available to Alabama policymakers. That voters are concerned about taxes and tax reform should come as no surprise. That the issue ranks tenth, however, is unexpected. The survey did not ask the direction or nature of tax reform. Certainly, voters and policymakers have differing concerns about Alabama’s tax policy. Taxes could be too high, too low, insufficient, or unfair. Recent research suggests that all of these can be true at the same time. Taxes can be high – Alabama’s sales tax rates are among the highest in the country. Taxes can be low – Alabama collects the lowest amount of property tax revenue per capita in the nation. The per capita collections could be doubled, and they would still be below the national average. Alabama per capita personal income tax collections are also lower than the national average. Taxes can be insufficient – Alabama’s state and local governments collect less in taxes than state and local governments in any other state in the union. That means governments here have less money to spend to provide similar levels of service. Taxes can be unfair – Taxes are not low for everyone. Because of the imbalance in the tax structure, taxes fall more heavily on some groups than others. Alabama’s tax system is the 12th most regressive state and local tax system in the nation, meaning the poor pay a greater share of their income in taxes than the wealthy. Why Is Tax Reform Important? Public services in the United States, things like education, roads, and prisons, are generally funded through a mix of taxes and fees assed to all taxpayers. The structure of the federal system and the fifty state systems are complicated and the subject of ongoing debate. Voters and policymakers can and do argue over the details of the tax structure. However, there ought to be broad agreement on two fronts. First, the tax system should generate revenue sufficient to meet the needs and demands of the public. The Alabama Priorities Project and other PARCA research suggest that many Alabamians do not believe that Alabama spends enough on public services. Year after year, session after session, the Alabama Legislature returns to Montgomery to answer the same, age-old question: “What are we going to do to fill the hole in the General Fund Budget?” Certainly, there have been times over the years that this was not the case, but for the most part this question has been asked annually for decades. How Do Alabama Taxes Compare? In PARCA’s 2017 report, How Alabama Taxes Compare, we reported that Alabama’s state and local governments collect less in taxes than state and local governments in any other state in the union. In 2015, Alabama state and local governments collected a total of $15 billion in taxes, or $3,144 per resident. Across the U.S., the median value for state and local taxes per capita was $4,379. The median state had a per capita tax advantage of $1,235 over Alabama. In other words, if Alabama collected taxes at the per capita rate of the median state, local and state governments here would have an additional $6 billion to spend building and maintaining roads; providing police and fire protection; operating civil and criminal courts; supporting schools and colleges; libraries and parks; and the myriad of other functions government performs. National comparisons are not always convincing because of regional economic differences, but Alabama stands out even in the Southeast. The figure below presents two sets of calculations. On the left, the Southeastern states are compared and ranked on their total state and local tax collections divided by their populations, producing a total for tax collections per capita. The chart on the right shows the per capita tax advantage of other Southeastern states over Alabama. Alabama ranks at the bottom. The state closest to Alabama in terms of per capita tax collections is Tennessee, which collects $126 dollars more per resident than Alabama. The top Southeastern state in terms of taxes per capita is Louisiana, which collects $809 more per resident than Alabama. As a bottom line, Alabama governments have less tax money available to pay for those services. However, this is not widely understood. PARCA’s 2017 public opinion poll revealed that 34% of voters believe they pay about the same in taxes as those in neighboring states and 29% believe they pay more than residents of other states pay. Voter concern about Alabama’s tax system or doubts about its adequacy and fairness can be troubling to policymakers at every level. Alabama has two sets of options: piecemeal refinements or broad-based reform. State and local governments could adjust sales tax rates. Decreasing rates will further reduce revenue. Increasing rates will make the tax system more regressive and could have diminishing returns. Sales taxes can also be very volatile. Tax collections increase and decrease as retail sales increase and decrease. This makes revenue unstable in volatile times and disastrous in periods of significant economic downturn. Moreover, changing consumer habits affect sales tax revenue. As more and more commerce shifts online, state and local tax collections are impacted. State and local governments could expand the number of services that are taxed. Alabama applies its tax to almost all sales of goods, but it does not apply the tax to most kinds of business, professional, computer, personal, and repair services. In recent decades a greater share of economic activity has shifted toward consumption of such services. Alabama taxes 22% of services – the average state taxes 55% of services. The state could increase and stabilize revenue through increases to property taxes. Property taxes are hard to change in Alabama. Caps on property taxes have been placed in the Alabama constitution, and any change to property tax rates requires approval not just from the Legislature, but also by a vote of the people. 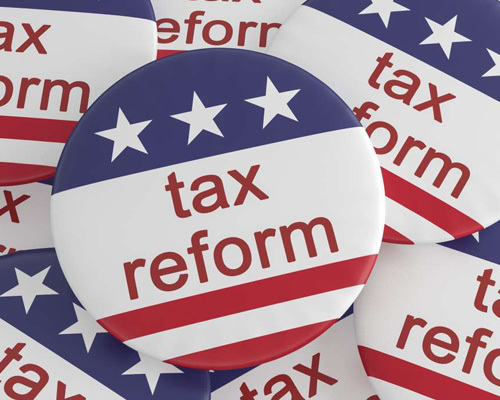 Since 1991, three major tax reform proposals have been developed (The Alabama Commission on Tax and Fiscal Policy Reform in 1991, The Tax Reform Task Force in 1992, and Governor Riley’s Accountability and Tax Reform Plan in 2003). As Jim Williams notes, “Experience has shown that Alabama voters are unlikely to favor a comprehensive reform package.” However, while none of the major reforms were initially adopted, in the years since, a number of measures tracking or closely related to those systematic reform proposals have been adopted. Alabama’s tax system is not balanced. Policymakers can improve voters’ confidence in the tax system and stabilize revenue by seeking a better balance of taxes on income, property, and transactions – what we earn, own, and buy. View the printable PDF brief here. Alabama Legislature. (2017, May, p. 1). Interim Report from the Joint Task Force on Budget Reform.